Quick! Let’s press the reset button before the holiday food and alcohol frenzy begins! I created this 5 day Autumn Reset for you, so that you can still enjoy your weekends and holiday season fun, but then you have this plan to use Monday-Friday to get you feeling fab again. I want you to be able to do this plan before the holiday madness starts, but also while the holiday food craziness is happening too. This way, even if you have boozy, sugar fuelled weekends, you can balance it out during the week with some healthy, nourishing goodness. It will be like pressing a reset button. Even if it’s just so you can do it again the next weekend. At least then it balances out. I know life happens and I want you to enjoy life and have fun, just offset the sugar and bubbles with some of this goodness and you will be good to go! A 5-day plan means you can enjoy your holiday parties and entertaining on the weekends, and then keep coming back to this plan or the recipes during the week to press reset to undo some of the damage or give your body a break before you hit the parties again at the weekend! Detox, before ya retox, right? Kidding…kind of. I’m excited for these 5 days of healthy, delicious eating to drop a few pounds and the bloat, increase your energy, get your skin glowing and kick the sugar cravings. I want you to be wearing all your winter clothes without feeling like you need to hide under baggy sweaters. And like everything in life, it’s way more fun with friends, so are you in? 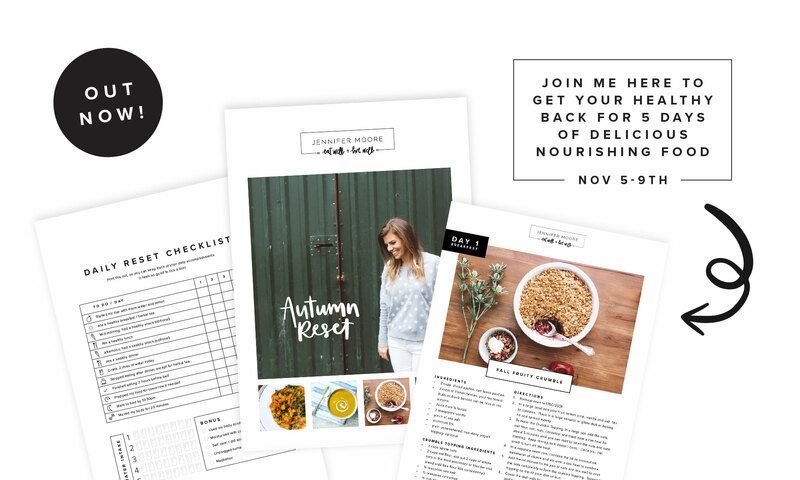 Autumn Reset, is a 5 day, healthy meal plan that you can do anytime, from anywhere in the world. Yes, I am running it over set dates from November 5-9th, but if you can’t join me then, you can still do it. You will get the same benefits and everything will still be available to you. I want this to fit into your life. You can also call it a detox, but sometimes a detox seems scary. You might think of being hungry, just drinking juice, or eating weird stuff on a detox, but my Autumn Reset: 5 Day Meal Plan is pretty much the opposite of all of that. This is 5 days of seasonal healthy eating. Eating real, whole foods that you can find at the grocery store. Yes, we will cut some things out of your diet that aren’t contributing to you feeling amazing or fitting into your clothes better, but you won’t miss them. Plus, it’s only for 5 days, you stick to anything for 5 days. And guess what? You won’t have to think about a thing- I’ve done it all for you. I am going to tell you exactly what to eat and drink for 5 days of healthy, deliciousness to make you feel amazing! You will get a meal plan, shopping list, recipes – everything you need and all you have to do is follow along- it’s fool proof. If you can read, you can do the plan. This 5-day plan is designed to help you kick your cravings- especially the sugar ones, reduce bloating and help you shift some unwanted pounds. It will increase your energy, get your skin glowing from the inside out, as well as improve your sleep and digestion. All that in 5 days? Yup! Sounds too good to be true, I know. But, I know it’s that easy and that the plan works, because hundreds of my past participants have told me so. If you’ve detoxed or followed one of my plans in the past, you’ll be happy to know there will be new recipes in this plan for you to try. This is not 5 days of juicing, just salads or weird ingredients you will have to search and pay a fortune for. No. This is not a diet or starvation. You will NOT be going hungry during these 5 days- I promise you that. I will not allow you to be hangry (hungry + angry). No weird powders or potions- you get to eat real, whole food and plenty of it. I am going to love you up with so much delicious food, your cravings, bloating, extra belly bulge and energy slumps are going to disappear! Yup, you will eat yummy food and probably drop a few pounds too. WHY DO THIS WITH ME? I mean, sure, you can create your own meal plan for 5 days and try to follow it by yourself. But, let’s be honest, even with the best of intentions, are you actually going to do it and then really stick to it for 5 days by yourself? I wouldn’t! Doing it by yourself is hard! But, when you have a group of new friends in our private reset Facebook group going through the same experience with you, there to answer your questions, give support and motivation, it’s super easy! I never do things like this alone-I need support and accountability. You’re way more likely to stick to the plan if you have me and a whole group of others, by your side. Plus, I’ve made sure you are getting all the nutrients you need from your food over these 5 days. Feel great, flat tummy & lost 7lb! But most importantly I’ve loved the food & feel re-inspired to continue with our ‘clean living. Calm, less bloated, relaxed, enjoying the fact that it’s been easy to prep and feeling determined to continue. I really enjoyed this week! The recipes were delicious and I’ve eaten a few things for the first time and loved them. The interaction on Facebook is great, in fact I just love the whole concept. You make it so easy Jennifer. Thank you so much! Have tons of fun. I know it sounds strange, but it’s a really fun week! The motivation, support and connection from the group is fab! You will enjoy so much good food, that you won’t even notice those nasties that might have crept into your diet in excess like too much sugar, caffeine, gluten, alcohol and dairy, disappear! Autumn Reset is an opportunity for you to connect back with your body and feed it what it actually needs, instead of listening to what your crazy cravings say! Did I say feel freakin amazing yet??? Yup, that too! We are going to cut out foods and common allergens like: dairy, caffeine, gluten, sugar and alcohol. This plan is 90% gluten free and vegan, but you can swap a couple easy ingredients to make it 100% gluten-free and vegan- I can help you. We will eat foods that will fill you up, and give you the energy you need for your busy life. I’ve lost 4lb in the first three days of the reset! Best motivation to keep going ever! If you are scared and wondering, “What the heck am I going to eat for 5 days and how am I not going to be hungry?” I want you to know: I am a foodie and a trained health foods chef. I love food. I am not interested in going hungry. I have guided thousands of people through plans like this, and ya know what? Not one of them has ever said to me they were hungry. Jenn, thank you so much for doing that! Just want to say thanks again for the reset! Am totally back on track after loosing the will a bit post baby. I feel in control and so much more positive and have more energy and my breast milk supply has actually increased from all the nutritious food. Can’t wait to do some more in the future! So I need to thank you so much. I know it sounds crazy but the reset has truly changed how I eat and think about food. Your recipes are incredible and there hasn’t been a single one I haven’t totally loved. You definitely found your calling in life. Thanks for helping out an old friend! Keep doing everything you’re doing because you’re making a difference! Thank you so much Jenn for your passion & dedication to provide us with such nurturing. I truly know when I sign up to your 5 day resets that you have put so much into it to help us counter balance the off days. I’ve loved this week & I’ve felt awesome, energised, buzzing, and not at all bloated. Wonderful to lose that bloated feeling and exhaustion! I am grateful for you Jennifer Moore! A complete 5 Day Plan, you will know exactly what to do and when each day! This will be your bible during the 5 day program. 5 days of quick, healthy, seasonal recipes, laid out in an easy to follow format, so you can whip them up in no time. A 5 Day Meal Plan, complete with 3 meals per day, plus snack ideas. A shopping list with all the your ingredients for the week. Access to a private Facebook group where you have access to me to ask all your questions! This is a great place for sharing with other participants, as well as staying inspired and motivated! This is always everyone's favorite- the support that happens here is amazing! Daily emails with tips and tricks to keep you motivated and inspired. 1. Sign up by clicking on the sign me up button below. After you sign up, you will receive a welcome email from me. I will send you your full pdf plan for you to download a few days before we start so you will have plenty of time to prepare and gather your ingredients. If you use gmail, look under the promotions tab. 2. Autumn Reset will run from November 5-9th, 2017. But like I said above, you can do it anytime you like if those dates don’t work for you. 3. You can get involved from anywhere in the world! Isn’t technology cool?!?! 4. £49 When you click on the sign me up button below you will be taken to a page that says checkout with Paypal, click on the paypal button and on the next page you have the option to log in and pay with paypal or check out as a guest if you don’t have pay pal and then you can pay with a debit, or credit card. You don’t have to use Paypal. Important: All detox info will be sent to the email address you use when you sign up or that is linked to you Paypal account if that’s how you pay. Email me if you want me to use a different email address. Jennifer Moore thank you so much for another amazing journey! Since I have 1st met you and did the eat well live well: I have stopped smoking, I do something nice for myself without feeling guilty, I have learned to say no, I feel more confident, I love my body and look after it, challenge myself, set up a bucket list (going to NY to visit the Met next week-end!!!! ), have learned to enjoy little things and smile more. The resets give me the strength to keep going. It is so much more than food! Thank you! I love you! You’re busy. Whether you are busy at work or at home with the kids, this plan is totally doable. You won’t be spending hours in the kitchen and within a few days you will have more energy than you know what to do with to help you get through your busy days. You’re new to healthy eating. Don’t worry, don’t be scared. I will ease you into this and it’s not hard. You won’t have to use willpower to struggle through the 5 days. You will be eating so much delicious food, you won’t even notice you are detoxing, except for how great you are feeling. You’re scared you won’t be able to do 5 days. That’s okay, maybe you do 3 days and you will have a whole bunch of extra new, healthy recipes you can add to your repertoire. Even if you don’t last for the whole 5 days, you will still benefit and can use the extra recipes whenever you want. You can’t cook. That’s okay, the recipes are super simple, you don’t need to be a chef. You don’t have any fancy equipment or a juicer. That’s fine. If you have a blender, great. If not, there will be other options you can choose from that don’t require equipment so you can still join in! Or see if you have a friend that has a blender you can borrow. You want to learn more about healthy eating in a way that is sustainable and yummy so you can make healthy choices for you and your family. You want to shed a few pounds. My past participants who have followed the plan, tend to lose 2-5 pounds during the week. Please note that results differ for everyone, some don’t lose anything. This is not a quick weight loss plan, but a chance to fill our bodies with nourishing foods that will make us feel good for 5 days. You want to try a healthy eating plan, but don’t want to do it alone. Don’t worry, you won’t be alone! I will be with you and you can share the experience with other from around the world on the Facebook page. You have dietary restrictions. No problem, all the recipes are dairy free, sugar free, and can be made vegan, gluten free and delicious. You’ve detoxed with me in the past, enjoyed it and felt great and want more of that feeling! I’ve got new recipes for you, that you can add to your list!